Commercial gutter systems come in all different shapes and sizes. 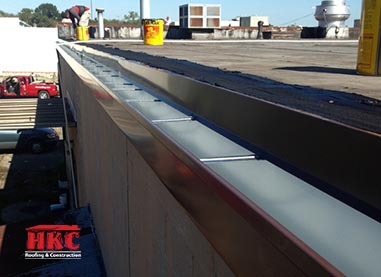 HKC Roofing has the capability of fabricating commercial gutters at our in-house sheet metal shop to match your existing gutter system. It’s important to perform a water volume calculation when sizing gutters and spouting to ensure the proposed gutter system can handle the volume of water draining from the roof. The Cincinnati and Northern Kentucky area ranks 8th in the country for the number of days of annual precipitation. Our staff has the experience and expertise to recommend a gutter system suitable for your building’s water drainage.